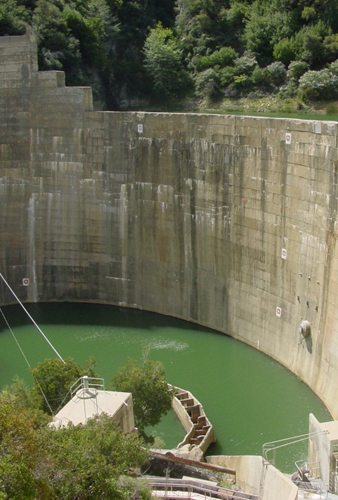 Matilija Dam was constructed in 1948 on Matilija Creek in Ventura County to store water for agriculture and to provide flood protection. Because of sedimentation that has occurred behind the dam, it currently has very little water storage capacity and virtually no flood control function. The US Army Corps of Engineers prepared a feasibility study to evaluate alternatives for removing the dam in order to allow passage for steelhead trout and allow sediment to move downstream to replenish sand on area beaches. Aspen prepared an EIS/EIR to support the Corps feasibility study. In addition to preparing the EIS/EIR, Aspen prepared GIS vegetation mapping for the Ventura River corridor and Matilija Creek through a combination of aerial photo interpretation and field surveys. Aspen also supported the project’s Environmental Working Group in evaluating and scoring the quality of existing habitat and projecting habitat conditions under a future without-project scenario. In the next phase of study, Aspen evaluated the environmental impacts of the various alternatives and recommended measures to mitigate significant impacts. Aspen also assisted in estimating the change in habitat conditions that would result from implementation of each alternative. The local sponsor for the project is the Ventura County Watershed Protection District.